Obesity places an added workload on the heart which is directly proportional to body weight. The risk of developing heart disease increases as body weight increases. The heart requires more oxygen, because it must pump harder to supply blood to a larger area. Obesity is closely linked with a poor diet (a high fat and cholesterol intake), and a sedentary lifestyle. Elevated cholesterol levels are also linked to heart disease. Cholesterol deposits on the walls of blood vessels may lead to clogged arteries. Cholesterol can be controlled by diet, weight loss, and medication. Diabetes is characterized by an elevated blood sugar level due to an inadequate secretion or absence of insulin. It is a major risk factor for atherosclerosis and is compounded in the presence of other risk factors. Those with diabetes tend to have high cholesterol, triglycerides, and blood pressure. Therefore it is important to maintain good control of this disease with proper body weight through diet, exercise, regular medical checkups, and medication if ordered by a physician. The USDA's Food Guide Pyramid makes it easy to choose a balanced diet from the five major food groups. The base of the pyramid contains the largest portion of food in the form of grains: bread, cereal, rice, and pasta. Add the recommended number of servings from the fruit, vegetable, milk, and meat groups for a balanced diet. It is important to eat a variety of food from each group. The chart below shows examples of serving sizes. Please note: This is a general guide for people without dietary restrictions and may be modified by your physician or dietitian. Fat: An essential nutrient used by the body for many functions including energy, thermal insulation, vital organ protection, cell structure, and function. It is recommended that less than 30% of food calories come from dietary fats, which are present in foods of both animal and vegetable origin. Cholesterol: A waxy, fat related compound in the body tissues and organs of man and animal, cholesterol plays a vital role in metabolism. However, cholesterol is a key part in the creation of fatty deposits in the arterial walls and an increased blood cholesterol is a risk factor in coronary artery disease. Cholesterol is found only in foods of animal origin. It is recommended that the daily intake of dietary cholesterol be no more than 200 - 300 mg. per day. Low Density Lipoprotein (LDL): A type of cholesterol carrier which deposits cholesterol on the walls of blood vessels. High Density Lipoprotein (HDL): A type of cholesterol carrier which helps remove cholesterol from the bloodstream. Saturated Fat: Fat that is usually solid or semisolid at room temperature and can be found in animal as well as vegetable sources. A diet high in saturated fat frequently increases blood cholesterol and LDL. 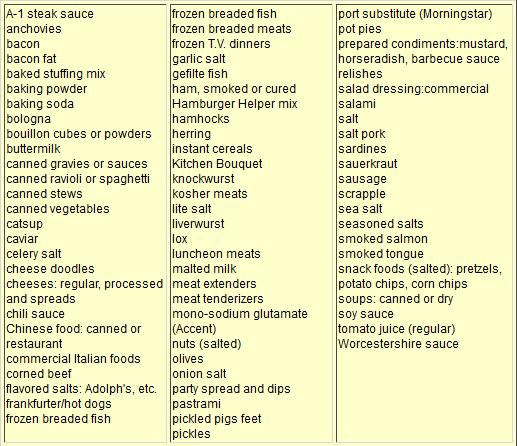 Polyunsaturated Fat: Fats primarily from vegetable sources which are generally liquid at room temperature. When used in moderation, they tend not to effect blood cholesterol levels. 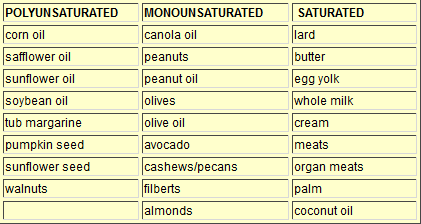 Monounsaturated Fat: Fats which help to lower blood cholesterol when used in place of saturated fat in the diet. Omega-3 Fatty Acids: Fats found in fish sources which help to lower LDL cholesterol. Protein is essential for good health. But many protein-rich foods are animal products which are also high in saturated fats and cholesterol. Fatty cuts of "red" meat, and organ meats are the worst offenders. In order to obtain the best protein with the least amount of fat and cholesterol, eat more fresh water fish, legumes (dried peas, beans, and grains), and skinless poultry. When you do eat meat, trim all visible fat before cooking and limit the portion size to three ounces/day (the size of a pack of cards). Skim milk, yogurt, and skim milk cheeses are the best dairy choices. When buying cheese (which is traditionally high in saturated fat), look for low fat varieties such as farmer' s cheese, pot cheese, uncreamed cottage cheese, or part-skim ricotta. Whole grain breads, cereals, and pastas are your best choices. When buying baked products, such as muffins, read labels carefully. Many obtain half their calories from saturated fats such as palm and coconut oil. With few exceptions, fresh fruits and vegetables are naturally low in saturated fat. Palm oil, palm kernel oil, coconut oil, and hydrogenated vegetable oils are highly saturated. spreading sandwiches with mustard instead of mayonnaise. switching to "light" mayonnaise (1/2 the fat). buying "old-fashioned" peanut butter with no added fat and pouring off the oil instead of mixing it into the peanut spread. using tub or pourable margarine instead of stick margarine or butter. sautéing foods in broth, bouillon, or using oil sprays. substituting two egg whites for the whole egg in recipes. buy skim milk or 1% fat dairy products (which contain 28% of their calories from fat) and leanest of meats. use more skinless poultry, fish, low fat dairy products, tofu, and legumes for protein sources rather than red meat. prepare small portions of meats by baking, broiling, stir frying, poaching, steaming, or microwaving. Do not prepare meats with additional fats. Drain cooked burgers on paper towels. use nonstick pans and spray. skim the fat off of all gravies, soups, and sauces. (Best to chill it first). use spices and herbs instead of added fat. use low-fat cottage cheese and yogurt, instead of sour cream and cream cheese, in dips and on potatoes. use fruits, ice milk, or nonfat yogurt for dessert. make complex carbohydrates (whole grain starches, fruits, and vegetables) a larger part of your meals. 1 teaspoon table salt contains approximately 2000 mg sodium. 1 tablespoon soy sauce contains 1029 mg sodium. 1 teaspoon regular meat tenderizer contains approximately 1750 mg sodium.